Pope John Paul II and Rabbi Elio Toaff. On that date, fifty years ago, Pope John XXIII issued the edict Nostra aetate (In Our Time) - rejecting the ancient assumption that the Jewish people tortured and crucified Jesus Christ. In the years that followed, the Church took further steps - slowly and hesitantly but generally moving in the right direction - seeking to manage their own collective guilt for many centuries of Jewish suffering. 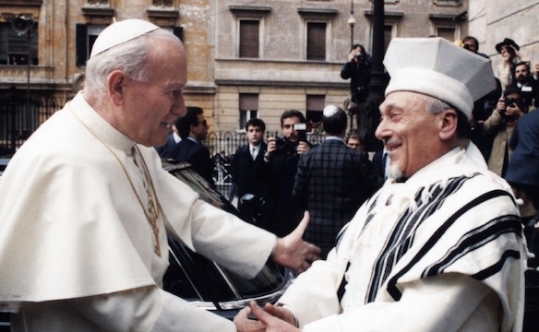 No one will forget Pope John Paul II's visit to the Great Synagogue of Rome on 13 April 1986, when he embraced Chief Rabbi Elio Toaff. setting for the local Passion play. Inside the John Paul II Ampitheater at Sordevolo on 28 August 2015. Every five years since 1815, the inhabitants of the tiny Piedmontese town of Sordevolo (current population 1,300) have staged an imposing recreation of the last days of Christ - as it was long imagined by Catholic believers. mash-up of Jewish sacred regalia. 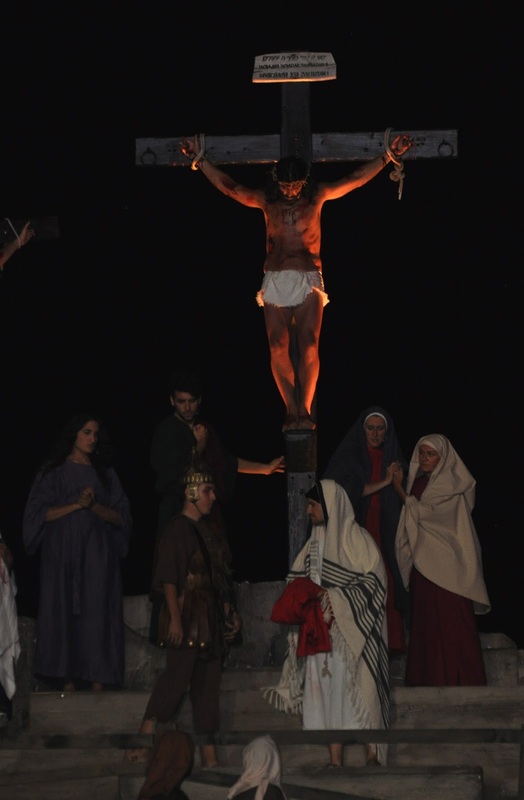 The historical roots of this particular Passion play go deep. 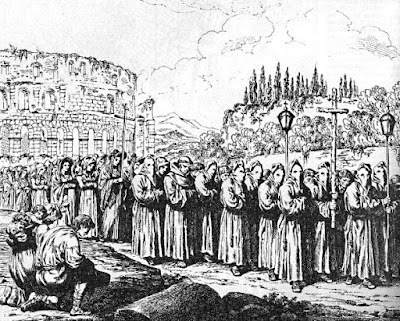 The Sordevolesi are reciting a five-hundred year-old dramatic text that was staged in the Colosseum in Rome on Good Friday from circa 1490 until 1539 - giving epic expression to the Jew-hatred of that time. 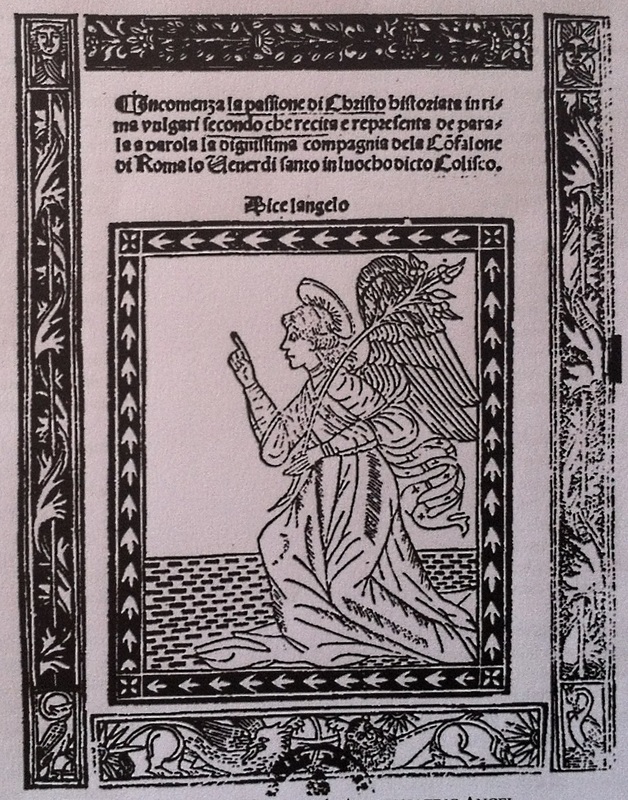 Giuliano Dati, a Florentine cleric, wrote this play and first published it in Rome around 1496. Here begins the Passion of Christ recounted in vernacular rhyme, word for word, as it is recited and enacted by the most worthy Company of the Gonfalone in Rome, on Good Friday, in that Place called the Colosseum. It is difficult to describe the cumulative effect of hour after hour of rhyming verse in colloquial quattrocento Tuscan - now overlaid with Piedmontese inflections. Still, it is an amazing show. No one can doubt the dedication of the participants and their pride in sharing something wonderful with the world. The Sordevolo Passion is not only an extraordinary historical survival. It is a defining feature of local life and a labor of love - representing a massive investment of time, energy and resources. Belly Dancers at Herod's Debauched Oriental Court. But 1490 was then and this is now. In addition to antique literary and theatrical forms, the Sordevolo Passion enshrines the assumptions and prejudices of another age - taking us back to a time when loathing Jews was not only normal but an essential element of religious, social and cultural belief. But what if the spectator is both a Jew and an historian? You find yourself watching the play with two sets of eyes. While admiring the intricacies of a rare and valuable historical artifact, you feel your mind seizing up and shutting down - like an overheated computer. Is THAT really happening NOW? Right in front of you? Are those absurdly stereotyped Jews really grimacing and waving their arms only a few yards away? And then, what about the other characters? Are they actually screaming the anti-Jewish imprecations that you seem to hear? According to Catholic theology, God willed His Son's death and resurrection. So the relentless mechanism of the Passion - compellingly expressed by Giuliano Dati - was all part of a Divine Plan. But none of the horrors inflicted on Christ - betrayal, torture and crucifixion - could have occurred without the eager involvement of the Jews at every stage. Nor would the storyline have made any sense - whether in the Colosseum in Rome five-hundred years ago or in the ampitheater in Sordevolo today. The relationship between Judas and Christ - betrayer and betrayed - defines the drama. But the betrayal itself is a Jewish conspiracy and Judas himself an archetypal Jew. A Priest of the Temple counts out the infamous thirty pieces of silver. Judas leads a posse of Pharisees, reinforced by a detachment of Jewish soldiers (distinguished from the Roman soldiers by their oriental garb). Then Judas earns his blood-money, taking the Jews to apprehend Jesus - a rabble-rouser who seeks to subvert Jewish Law. The Jews cannot kill Jesus themselves - according to the letter of that very Law. So, they send Him off to their proxy - Pontius Pilate, Roman Governor of Judea. 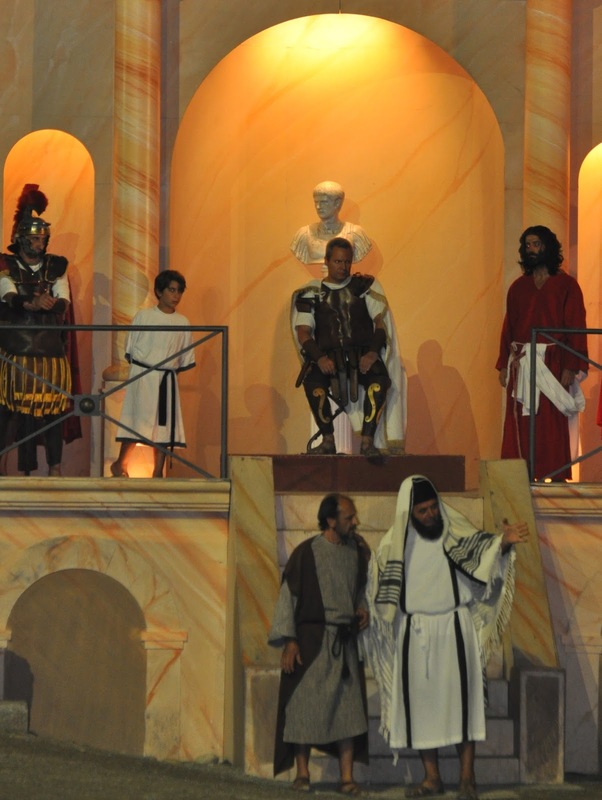 Christ with Pontius Pilate and the Jews at the Roman Praesdium. 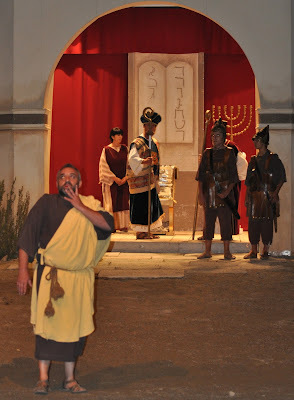 Pontius Pilate defends Jesus' innocence, but the Jews demand bloody retribution. Pontius Pilate then seeks a compromise. According to custom, a condemned prisoner is liberated every year at Passover - but the Jews clamor for Barabbas' release and Jesus' death. Christ, Pontius Pilate and a full slate of Jewish authorities. After the flagellation, Pontius Pilate makes a final plea for Jesus' life - vainly hoping that Jewish blood-lust has been sated. Jesus stumbles under the weight of the Cross. Jesus is dragged to his death, under the watchful eye of the Jewish authorities. Judas suffers remorse and seeks to return the thirty pieces of silver - but the Jews spurn him, now that he has done their will. Jews - both Pharisees and soldiers - figure prominently on Mount Golgotha. Below the cross, Jews vie for Christ's garment. 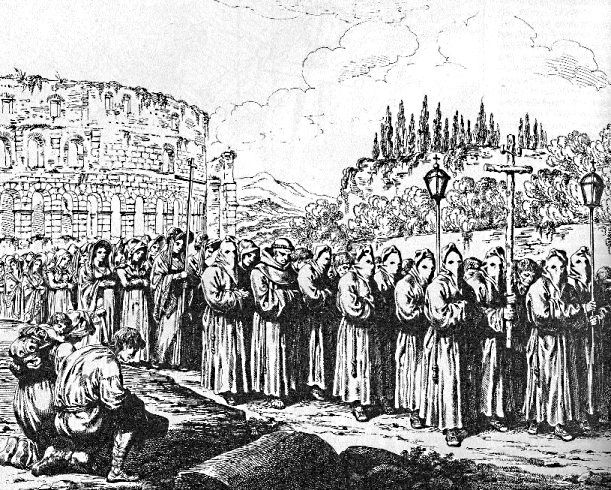 During Christ's protracted death on the Cross, the Jews escalate their derision and physical abuse. 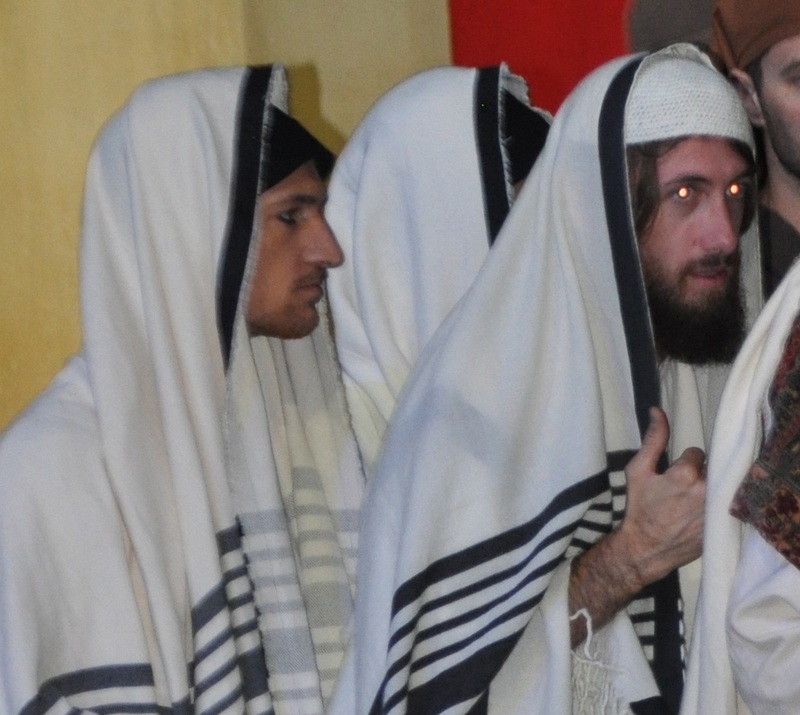 Three Jews cast lots for His discarded "seamless garment" and a gloating Pharisee wins. Mary and the dead Christ at the foot of the Cross. Then comes the Pietà, the Entombment and the Resurrection. God triumphs and the Jews lose. Mary and Christ with a detachment of Roman cavalry. So, the play is over. And then...what? Suddenly you are back in Sordevolo - not a fictive Jerusalem. All four hundred members of the cast stream out to take their bows - to rapturous applause. In full stage make-up. Including a battered but resilient Christ. Jewish soldiers - also the kids next door - in vaguely Assyrian helmets and trousers. Jewish matrons - maybe lady Pharisees? Last seen in the grocery store or laundromat, but without men's prayer shawls. .
And the wicked Pharisees themselves - on a first-name basis with everyone in town. After the play, in front of the Roman Praesidium: a smiling Judas (lower left) and Herod with Pontius Pilate (lower right). Then the audience floods the staging area - family, friends, neighbors and guests. And everyone hangs out, as if it were an extension of the nearby piazza. 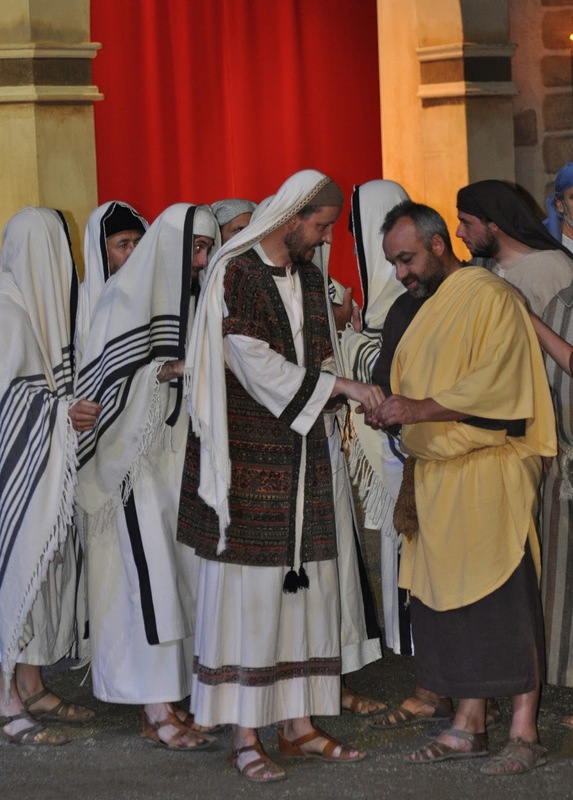 Pharisee father with Roman soldier son? In Italy, manifestazioni storiche - historic reenactments and the like - are a thing of their own. Especially in small towns. Whether they be battles on ancient bridges, medieval markets at local castles or football games in renaissance garb. Almost always, we leave with the same impression: The locals are doing it for themselves and each other - above all. The audience is certainly welcome but they are scarcely the main point. Mary and Christ - in their every day context. In the world of Italian manifestazioni storiche, the Sordevolo Passion boasts an exceptional pedigree - produced more or less regularly over the course of two centuries. And in concrete terms, it represents a breathtaking achievement - demonstrating a level of local cohesion that is difficult to imagine in most parts of the world today. But today being today, what about the Jewish aspect of the play - especially on the fiftieth anniversary of Nostra aetate and the two-hundredth anniversary of the Sordevolo Passion? Past generations of Passion Players, in front of the Museum in Sordevolo. "It's in our DNA", the director of the Passion recently observed. And that is certainly true, since local families have been handing down dramatic roles and organizational tasks from generation to generation. 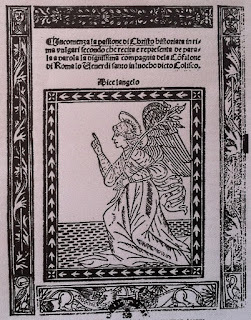 "Most Sordevolo residents know the text by heart", a featured actor noted. That is probably true as well - although memorizing verse after verse of quattrocento Florentine is no small task, even for a literary specialist. For a long line of Sordevolesi - it would seem - Giuliano Dati's vehemently anti-Jewish play has simply been "the play" - however alarming, objectionable and even bizarre it might appear to others, five centuries after its début in the Colosseum. Historical texts - like Dati's Passion - are first and foremost historical texts. And works of art - like the Sordevolo reenactment - are first and foremost works of art. But meanwhile, as cultural historians are quick to note, "Context is everything". The Sordevolo Passion is now entering its third century and rapidly developing an international following - with thousands of foreign visitors, especially from the United States. Questions are being asked that were never asked before, regarding the play’s meaning and intention. In a few weeks, the 2015 season will come to an end, then - almost immediately - the people of Sordevolo will begin preparing the 2020 edition. Along the way, they can address these emerging issues - helping all of us see their Passion as they want it to be seen. These 28 photographs from Sordevolo - including the self-portrait here - are the exclusive property of Lyle Goldberg.